Yorkshire Terriers are very small dogs, that’s why it is difficult for the owner to consider the appropriate quantity of the food for the dog. Overfeeding and underfeeding might result in the serious health issues for the Yorkies, therefore, it is essential to be careful about the food for the dogs. As we are familiar with the fact that Yorkies are most vulnerable to the various kinds of diseases and stomach problems so it is better to follow the nutrition meal plan and feed the dog as per demand. 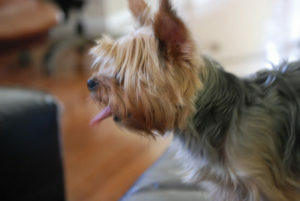 It is not possible to provide the exact information about the Yorkie’s quantity of food because different dogs require a different amount of food. Their food requirement varies according to their size and weight. In the case of the little puppy, you need to provide about 200 calories per day for the better and proper growth. Generally, an adult Yorkie needs 150 calories in a day. To fulfill the Yorkie’s food requirement, simply divide the food into three or four parts and feed the Yorkie after every 3-4 hours. As it is not possible for the little dog to finish the meal. 150 calories in a single course. To make your dog healthy and vigorous, select the meal that contains following agents which play a vital role to make the Yorkie hale and hearty. Choose the product that contains about 40% of the protein which is the best food item for the Yorkies as it can fulfill the requirement of the dog. The food with nutritive formulas such as Omega-3 and Omega-6 is very helpful to keep the coat shiny. You can make your dog’s muscles stronger by giving it carbohydrates and the best food products that contain enough amount of carbohydrates include barley, brown rice, and oatmeal. Vegetables and fruits contain an appropriate amount of minerals and vitamins that can make your dog energetic throughout life. Take special care about the water requirement of the Yorkie because water deficiency can cause digestion problem, skin disease, etc. Yorkie need 10-ounce water per day to provide fresh water to keep the dog healthy.